Every guest at Denver Zoo helps animals just by visiting the park. Through engaging experiences and conversations, staff and volunteers share a spectrum of actions visitors can undertake to support the care for zoo animals and help protect wildlife locally and around the world. Denver Zoo has about 2.2 million visitors/year and dedicates about $2.2 million to wildlife conservation every year. That's roughly $1 per visitor. Pretty cool, right? On-site education programs are designed intentionally with the age, experience, and interests of the participants in mind. The list of cool programs ranges from one hour early childhood exploration workshops to overnight camp outs; from week-long day camps, to a night just for Scouts. All ages are welcome to join in the fun and learn how to help animals. Connect with zoo animals through up close experiences daily throughout the zoo and discover how you can help wildlife from our staff and volunteers. Put your passion for animals to work as a Denver Zoo adult or teen volunteer. 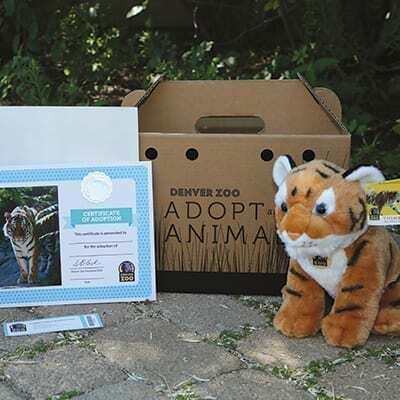 Engage our guests and support the Denver Zoo mission. Denver Zoo’s wildlife conservation efforts at Denver Zoo and around the world depend on giving from our community. Maintain or upgrade your membership, drop off a donation, or consider a bequest on our behalf. Adopt an animal! Visit our Adopt an Animal page for more information. Every time you visit you help animals. Return for an event, a special program, or to check us out in a different season. We’re open every day! Tell someone about Denver Zoo! After you’ve learned how you want to help animals, make sure your family and friends know too. Conserving resources needed to heat our homes (or cool them in the summer) results in less disturbance to wildlife habitats. Changing furnace filters, caulking around windows, and using an automatic thermostat at a lower setting all reduce your heating impact and your monthly bill. Colorado’s water resources are limited and refreshed annually from our winter snows. Follow lawn watering guidelines, purchase water-saving appliances, fix leaking sinks and toilets, and take the shortest possible shower. When landscaping your yard, research native plants that can feed local wildlife or provide them with a home for raising their young. Limit the use of pesticides. Offer fresh water throughout the year. Keep your cat inside to prevent it from preying upon neighborhood animals: an indoor cat is a healthy cat! Alternative transportation options abound in the Denver Metro Area. Research a new bus line for that next shopping trip or reach out to a coworker and try carpooling once a week. Biking and walking help conserve natural resources and result in a healthier lifestyle for you too! Everyday people can contribute to conservation projects through “Citizen Science.” Denver Zoo invites community members to take action for local wildlife through our Front Range Pika Project, and the Colorado Corridors Project. As a Conservation Outreach Partner, we encourage you to check out Monterey Bay Aquarium Seafood Watch. They recommend which seafood to buy or avoid, helping you select items that are fished or farmed in ways that have less impact on the environment.